Hey guys! Its finally here! My birthday is in 4 days! And we are getting the party started here! So very excited! You must comment/link/enter the challenge everyday. During these 4 days we are going to be posting projects! YAY! The list is at the bottom of this post. I made this tag, yes it is pretty plain but I still like it! I used Once Upon A Princess for the balloons. Spiced Marmalade and Peeled Paint Tim Holtz Distress Inks. Heirloom Gold Perfect Pearls Mists and one of my stamps "On Your Special Day, Thoughts of Joy are sent your way" from my Birthday Blessings Stamp Set. You can order it here. A Birthday Cakes Cricut Cartridge! ENTER MY CHALLENGE and like my facebook page! AND you have make a birthday project! So, make a new project everyday, or you can choose to enter once and just have one chance. YOU MUST HAVE A BLOG! But it doesn't take long! And here;s my Facebook page! Stop by and post on our wall if you hopped! If you don't have a facebook, just enter my challenge and leave a comment. But, you have to enter the challenge in order to win! I don't think your tag is plain, it is very nice. I'll enter your challenge. I already am a follower of your blog and your FB page too. Happy, happy birthday, Jillian! I have been looking forward to helping you celebrate this weekend and have made 4 projects in tribute to you. I hope you like them. your tag came out wonderful. BTW-sent by Deanne 's creative juice. Happy Birthday to you!!! Happy to be a part of your special day:) You ROCK!! Wishing you the best birthday ever, Jillian. Hugs!!! I don't think I'll be able to take part in your challenge, because I'm helping a friend whose mom passed away this week, but know that I would if I could. :) And, of course, I followed you on FB. 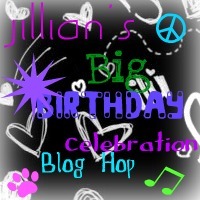 Cute birthday tag and loving the sentiment. Happy birthday! I hope it's ok to enter two days posts on one day. I missed this yesterday. Also, hope it's ok that it's coming from the hop we've put on for you! ;) If you haven't been there yet, please come by. On the fourth day I will have a little surprise for you! BTW, I don't think your tag is plain at all! I love the vintagey look you've done. It is awesome! Just entered my day two project. I messed up with the link on day one. I should have put just the picture instead I gave you the link to the whole post although the picture was on it. Believe it or not, I am still learning this blog stuff. Took me a couple of years just to get the courage to make my own. Any ways, let the countdown continue...hope you like the card. I gave you a link to the whole post too. I hope that's ok! Simple and Sweet!! This is a great tag! what they're talking about on the net. You definitely understand how to bring an issue to light and make it important. More and more people have to look at this and understand this side of the story. I was surprised that you are not more popular since you certainly possess the gift. you've got here on this post. I will be coming back to your blog for more soon. Excellent site you've got here.. It's hard to find quality writing like yours nowadays.